Tomorrow is Polish National Independence Day. On November 11, 1918 Polish nation regained its liberty after 123 years of occupation by three invaders: Russia, Prussia and Austria. The title of Emily's school presentation 'Poland - Alive Again' (click here to see pictures: http://forum.polishorigins.com/viewtopic.php?t=376 ) superbly expresses Polish nation dramatic history in 18th, 19th and 20th century. Click below to watch history video with beautiful music of Jacek Kaczmarski. 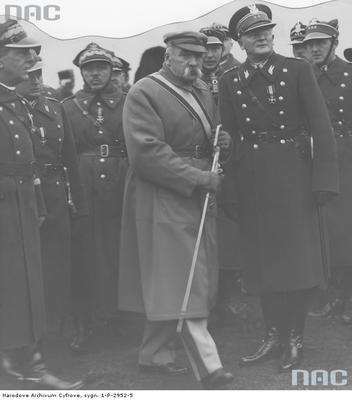 In the National Digital Archive - http://audiovis.nac.gov.pl/ - you can find a lot of old photographs - including those linked with the celebrations of the Polish Independence Day. You can view them if you follow this link. You can use Google Translator to translate the descriptions. Attached is a photograph of Jozef Pilsudski (http://en.wikipedia.org/wiki/Jozef_Pilsudski), one of the key figures in Poland's fight for independence. Bill from our Forum has posted about the Polish Google Doodle celebrating our Independence Day. 95 years ago after 123 years of captivity we regained our independence as a nation. We persevered. 11/11 1918 is one of the most important dates in the Polish nation history - Polish Independence Day. See this short history video prepared by mrcin1012 commemorating this hard period of our history. Since 1989 when communism in Poland collapsed we can again freely celebrate National Independence Day in the whole country and outside of it. Move back in time and see how this holiday was celebrated in 1938, less than a year before outbreak of World War II which ended by Soviet's occupation for another 50 years.